If you decide to slip your hand into a glove while in France then the chances are it came from the beautiful town of Saint-Junien, set amongst stunning rolling countryside in the Limousin. Seven workshops are responsible for keeping almost half a million French hands warm every year. The town is named after a devoutly religious hermit who would use the waters of a sacred spring to cure those who sought him out. The hermit's popularity was so immense that when he died his funeral was conducted by the Bishop of Limoges and an impressive tomb was constructed around his body. The religious significance of the site grew until eventually a monastery, and then the town we know today, was created around it. Despite it's spiritual atmosphere, the town became a hotbed of resistance during the Second World War. Troops heading towards the Normandy coast to take on the D-Day invasion found themselves held up here after a railway bridge was destroyed giving the Allies crucial time. If you enjoy painting then a short walk will take you to the perfect spot for setting up your canvass. Through the small lane next to the Porcelain factory you'll discover Site Carrot where a number of painters, including of course Jean-Baptiste-Camille Corot, were inspired to produce some of their most beautiful paintings. St-Junien has a fantastic wealth of architectural heritage, chief of which is the Monastery of St-Junien. This impressive building was constructed in the late 11th Century in a typically Romanesque-Limousin style. The main façade was only completed a century later, while the square chevet is from the 13th Century. The central bell tower collapsed in 1922 and was promptly re-built. Once you step inside keep your eyes open for the wonderful frescoes from the 12th and 13th Centuries that are dotted around. St-Junien's tomb, a triumph of 12th Century Limousin sculpting, can be found behind the main alter. 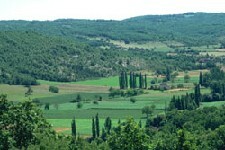 Not far from the town is the Chateau de Rochebrune, dating back to the 11th and 12th Centuries. Its most distinguished owner was Marshal Blaise de Montluc who made a name for himself by persecuting Protestants during the Wars of Religion. Fortunately, it is now very much public property so you can stroll the impressive grounds and tour the inside with its many artefacts from the Napoleonic era. Access to Saint-Junien couldn't be easier. You can now fly to nearby Limoges from a wide range of UK airports. The city is also linked to the high speed TGV rail network, which is the most comfortable way of traversing the country. 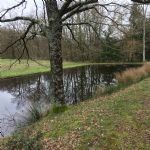 Property in Saint-Junien is highly affordable, as is to be expected from the Limousin region. Prices are rising due to widespread media praise and the decision of budget airliner, Ryanair to fly there. Hi - we have bought a house here right next to St Junien Golf Course. We are thrilled with the area and can't believe the prices. The town is wonderful and beautiful, the French people so warm and friendly, and there is a huge British presence. Every shop and supermarket is filled with English-speaking people, but the staff generally don't speak any English, so for those who are fluent in both languages there are some good opportunities. There are quite a few Dutch here also. Do you know Saint Junien better than we do? Do you have photos of Saint Junien? The town of St Junien is located to the west of the Hte-Vienne department of Limousin, a few miles west of the capital, Limoges. Access: Nearby Limoges has its own airport and TGV station. Economy: Tourism is the main income for the town. Interesting fact: The town was originally developed as a religious site around its monastery but became a main base for the French Resistance in the area during the Second World War.